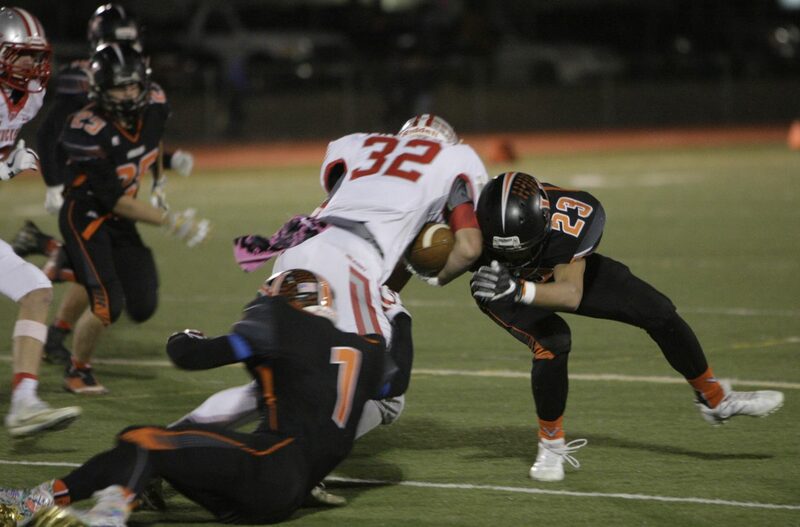 Truckee's comeback against Fernley on Friday, Oct. 20, came up short after a late touchdown drive by the Vaqueros. Fernley’s game-winning touchdown drive — that began with less than a minute left in regulation — spoiled the Truckee football team’s comeback from a 20-0 deficit on Friday, Oct. 20, in a contest that, ultimately, decided the regular season Northern League championship. After trailing all night against Fernley, the Wolverines took a 21-20 lead late in the game on senior Michael Doughty’s touchdown grab with 51.5 seconds left. The touchdown completed Truckee’s comeback from down 20-0 in the first half, but the Vaqueros responded by driving 68 yards in less than 45 seconds to retake the lead on a game-winning touchdown pass with only a few seconds remaining on the clock. Because Churchill County (7-2, 6-2 Northern League) lost 42-25 to Spring Creek (6-3, 6-2 Northern League) on Friday night, the game between Truckee (7-2, 6-2 Northern League) and Fernley (8-1, 8-0 Northern League) decided the league title, with the Vaqueros taking the regular season honor.